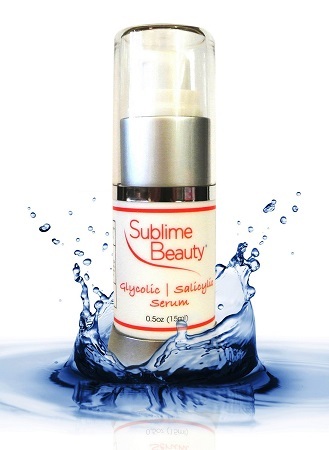 What does the Sublime Beauty Glycolic Acid Serum do? The Sublime Beauty glycolic acid serum exfoliates your skin, removes dead skin cells and unclogs pores. It also can help to heal and prevent acne, reduce oily skin, minimize hyper-pigmentation and age spots and so evens out your skin tone. Your skin looks healthier, cleaner and fresher. Who should use the Sublime Beauty Glycolic Acid Serum? Anyone who has tired, dull skin, clogged pores or suffers from acne or pigmentation problems can benefit from using this glycolic acid serum. Aged skin also benefits from the exfoliating effect of this serum as this can help to minimize fine lines and wrinkles and give you a fresher and more youthful appearance. How do you use this Glycolic Acid Serum? Clean your skin and apply a few drops of this serum to your face and neck areas. If you have aging skin you can use this serum about 3 times a week. If you have oily skin you can use it twice daily. For other skin types, use this alpha hydroxy acid serum daily and if your skin is sensitive, it might be wise to perform a spot test before you use this serum on your skin, even though the percentage of glycolic acid is quite low. You can either apply the serum to the entire area or just to specific areas that need attention. You don’t need to wash this serum off your skin, but can let it absorb into your skin. This glycolic acid and salicylic acid serum is paraben free, not tested on animals and is made in the USA. This glycolic acid serum has a concentration of 2% glycolic acid and 3% salicylic acid. It is suitable for frequent use and can be left to absorb into your skin. Glycolic acid is an alpha hydroxy acid and depending on its concentration, can gently remove the dead cells from the top layer of your skin or act more like a microdermabrasion treatment. Serums that include glycolic acid help to reduce fine lines and wrinkles, as well as hyper-pigmentation in your skin. Glycolic acid helps to even out your skin tone, minimizing dark spots, age spots and sun spots. Also, removing the dead cells from the outer layer of your skin can help to unclog blocked pores and reduce acne and blackheads. Your skin is left looking fresher, cleaner and healthier. Glycolic acid products have become quite popular recently. Another great exfoliant, salicylic acid also removes the dead cells from the top layer of your skin and is useful in the treatment of acne, blocked pores and blackheads. It is also great for reducing age spots and sun spots on your skin and evening out your skin tone. It can also relieve redness in your skin, due to its anti-inflammatory properties, which is great for acne sufferers as well. Used by the ancient Egyptians and called the plant of immortality, Aloe with its anti-inflammatory properties helps with cellular repair. It is very beneficial in the treatment of burns or sunburnt skin, helping to relieve redness and itchiness, reduces swelling and aids in healing the skin. 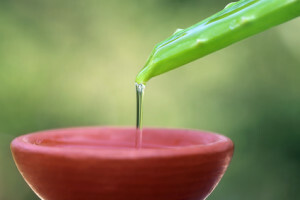 Aloe also contains many antioxidants which aid in fighting the sings of aging seen on our skin from free radical damage. Long known for its anti-inflammatory and astringent properties, Witch Hazel helps to heal our skin from insect bites, cuts and bruises. It is very beneficial in relieving eczema and other dry skin conditions and also helps to reduce the amount of oil in our skin. Witch hazel is a good ingredient for people suffering from acne, as it reduces the inflammation and helps to heal the skin. 100% of all customer reviews give this alpha hydroxy acid serum a 4 or 5 star rating. 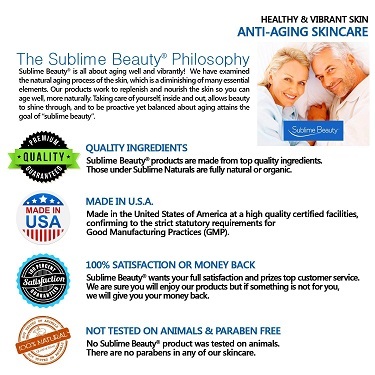 Everyone seems to love this serum, even an 80 year old customer left a good review! Customers say that their skin is softer and clearer, their acne has cleared up and their skin looks healthier and brighter. I have always had issues with my skin breaking out and using this serum seems to clear out my pores at night. It is a great product overall, it removes those blackheads after two or three applications from the area. This serum makes my skin look and feel absolutely fantastic! My pores appear smaller and my blackheads are finally clearing up. Does the Sublime Beauty Glycolic Acid Serum really work? From the number of great reviews for this glycolic acid serum, it is an unquestioned success with everyone. It is a little pricey and is only 15mls not 30mls like most other serums, but if it works well, then it is worth it. They also have a range of other serums, which seem very popular with customers as well. To read my other Glycolic Acid Reviews, Click Here. CDC Says HIV Is Increasing Among Transgender Women Anti Aging NewsNew data from the US CDC shows 1 in 7 transgender women are infected with HIV.